This 10-night Ireland and Iceland cruise was drastically different than any of our previous cruises. Similar to our Alaskan cruise (also on a Celebrity ship), the real focus here was on the ports of call. Even though we were sailing more so for the unique itinerary, the Celebrity Eclipse delivered a fantastic cruise. 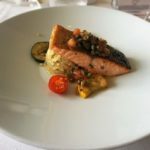 The ship offered superb and personal service, excellent food, and enough activities and options that we were usually able to find something to do during the cold sea days cruising the North Atlantic. We definitely recommend this ship for those sailing in this region, or even the Caribbean and Bahamas. 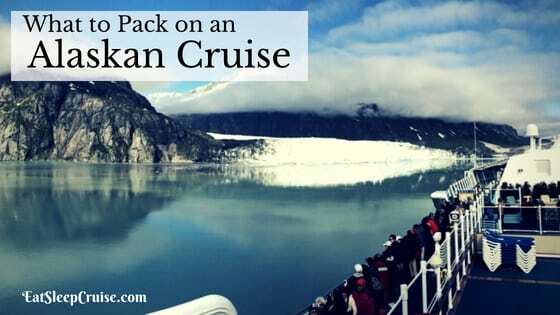 For travelers who have never visited Ireland or Iceland, the cruise was a gentle introduction to the different ports, but you will probably want to return to see and do more in these unique locations. 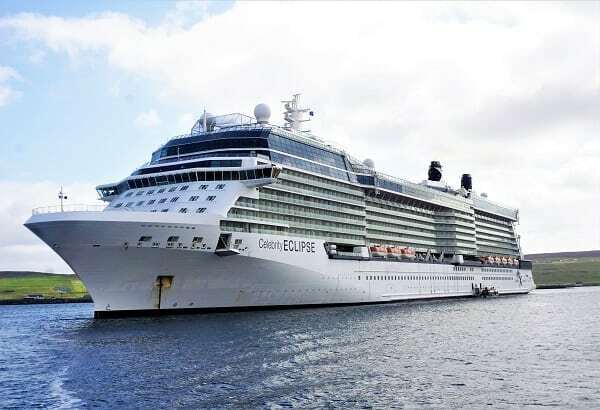 Celebrity Eclipse is a Solstice-class ship, which is currently the largest class in the Celebrity Cruises’ fleet. 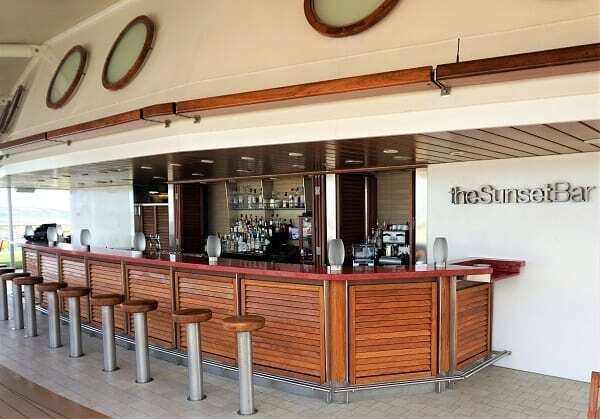 The ship boasts a few specialty dining restaurants, the Lawn Club, and various bars that offer signature drink menus. The ship is just the right size for cruising to unique destinations, and the layout is easy to navigate. 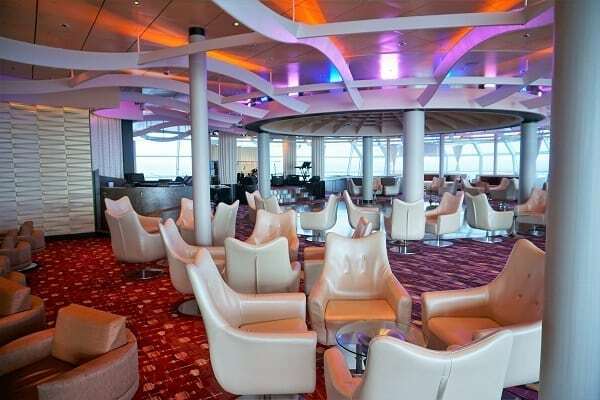 The Sky Observation Lounge on Deck 14 also provides wonderful views while cruising to cold-weather destinations and is home to several of the line’s parties and other activities. 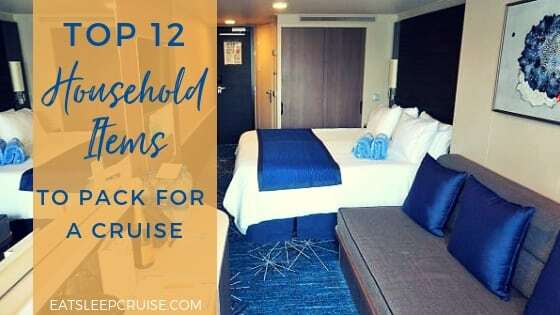 During the day, the weather did not allow us to really enjoy the sun deck or pools, but the indoor spaces never felt cramped for the 2,800 cruisers onboard. 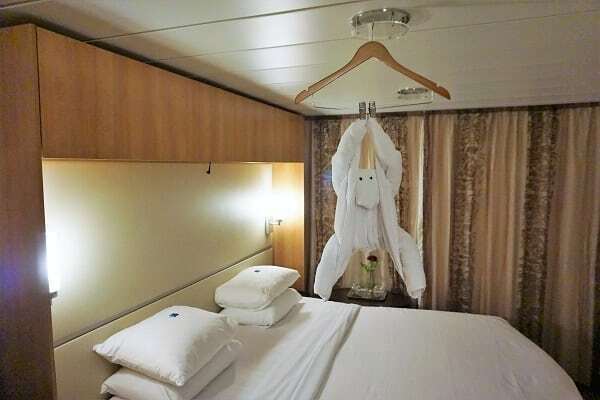 Overall, the ship was clean and comfortable, and the staff were always there to help. 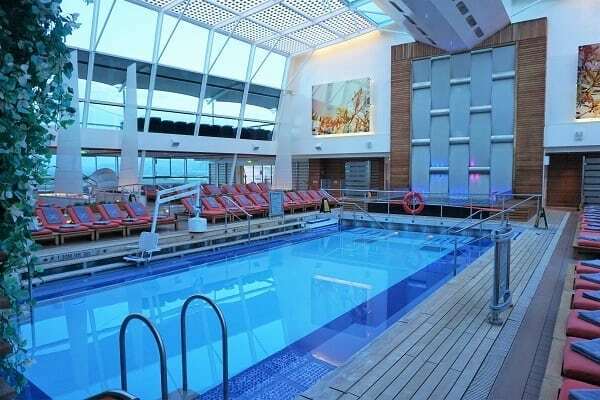 Even though we had sailed on this class of ship before, Celebrity Eclipse exceeded our expectations. 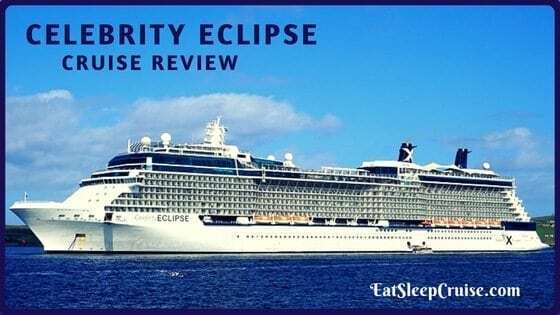 You can find out why in our Celebrity Eclipse ship scorecard from just a few weeks ago. 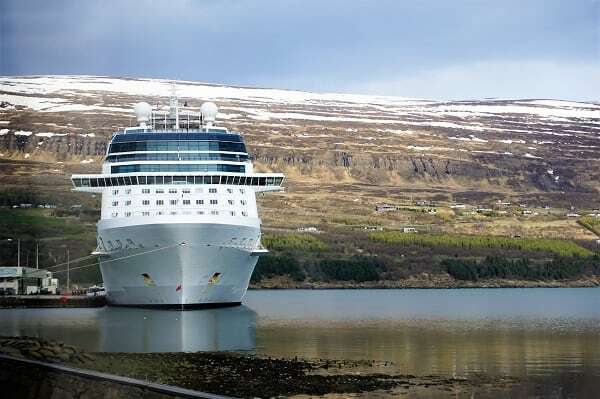 This 10-day cruise departed from an up and coming terminal in Dublin, Ireland and made stops in Belfast, Northern Ireland, Reykjavik and Akureyri, Iceland, and Lerwick, Scotland while even crossing the Arctic Circle. 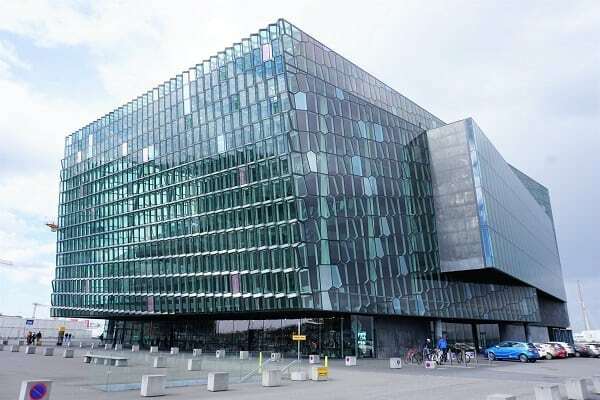 We spent a day and a half in the capital city of Reykjavik, giving us plenty of time to explore the major attractions. 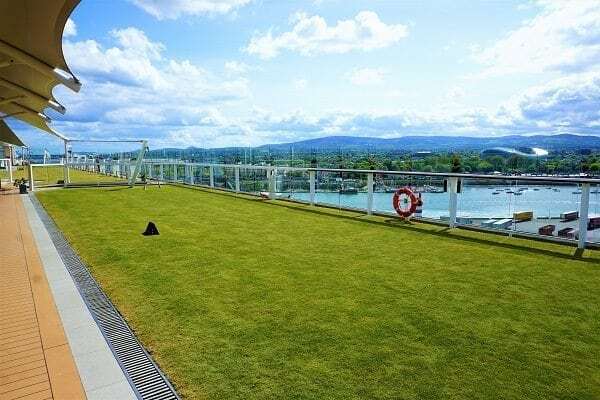 Initially, the itinerary included another stop in Cobh, Ireland but that was changed to include a full day in the capital city of Dublin at the end of the cruise. 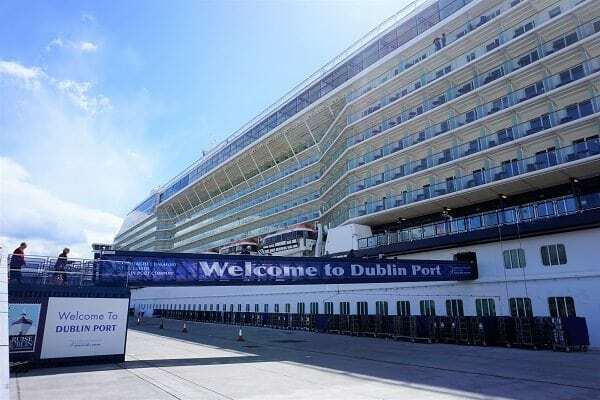 Since we had already spent 6 days touring Dublin and other parts of Ireland pre-cruise, we used this last “port day” to stay on the ship and enjoy the quiet, as well as the finally warm weather. There were some long days in port and a lot of touring, but we managed to do and see all that we had planned. This cruise was an excellent introduction to the different countries and left us wanting to return in the future. Each port of call offered something new and different. 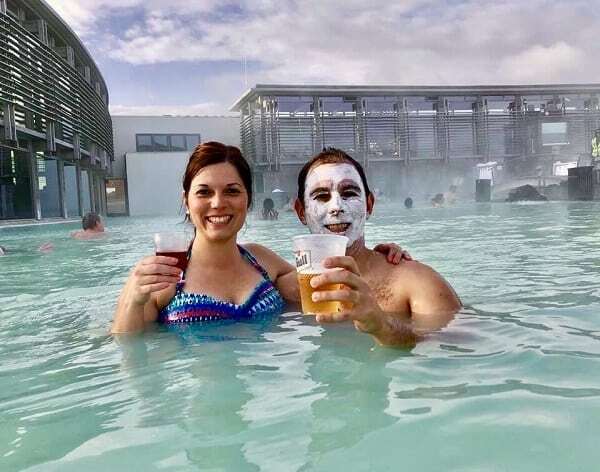 From the Game of Thrones tour in Belfast to soaking in the natural hot springs at the world famous Blue Lagoon in Reykjavik, each port was a new world to explore. Picking one of the excursions as a highlight is nearly impossible. Virtually, all of the trips were equally as exciting and photo-worthy. Back onboard, Celebrity Eclipse delivered some of the best service and food that we have ever had on a cruise. Hands down, the entire staff was friendly, helpful, and always seemed to have a smile on their faces. 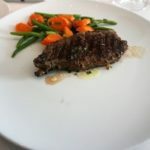 The food too was a step above the MDR fare we are accustomed to on the other contemporary brands. 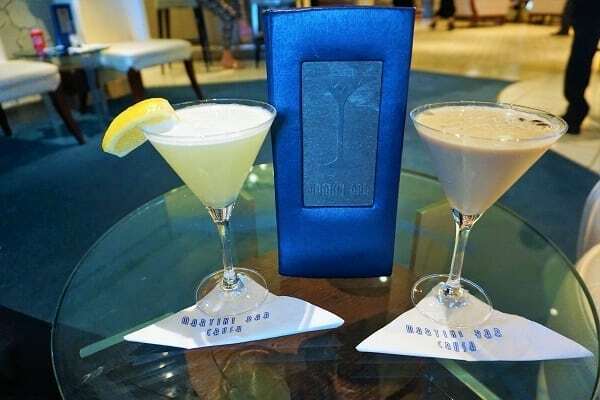 We would jump on another Celebrity Cruises’ ship just for the food and service alone, never mind the great drinks like the Princess’ favorite Martini Bar. If Celebrity Eclipse was missing anything, it was diversity in the entertainment and nightlife. 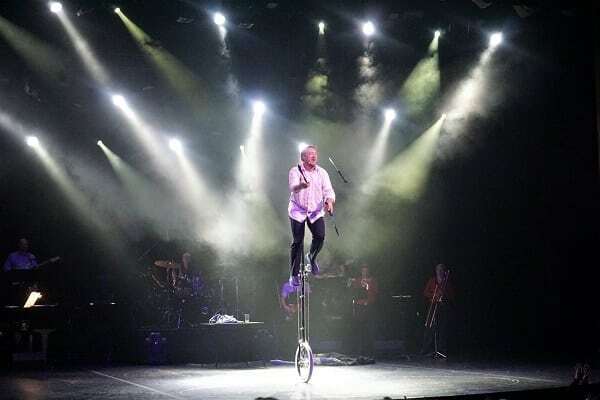 Granted, the entertainment was better than the shows we remember from our Celebrity Solstice sailing 4 years ago. 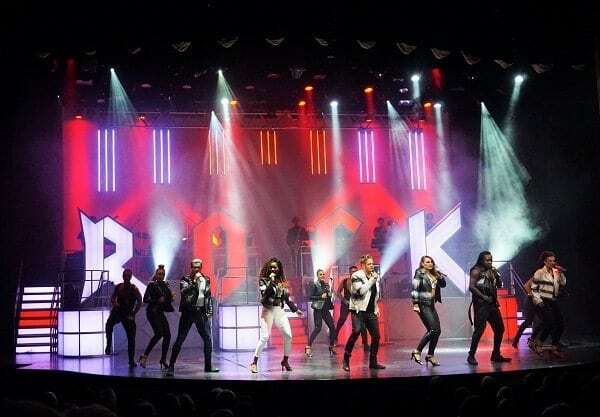 In recent years, Celebrity Cruises has invested in updating their production shows, and that investment did pay off. We agreed that the productions shows were more contemporary and engaging, with a great cast of singers and dancers. Although, the regular “headliner” acts were somewhat redundant, being mostly singers. We were surprised that there was not one comedy show the entire trip. On the last night, they did have a local Irish group, which was fantastic, but they should have offered more performers like this throughout the cruise. The same held true for the musical acts in the various bars and lounges and nighttime Celebrity Life activities which also seemed repetitive. 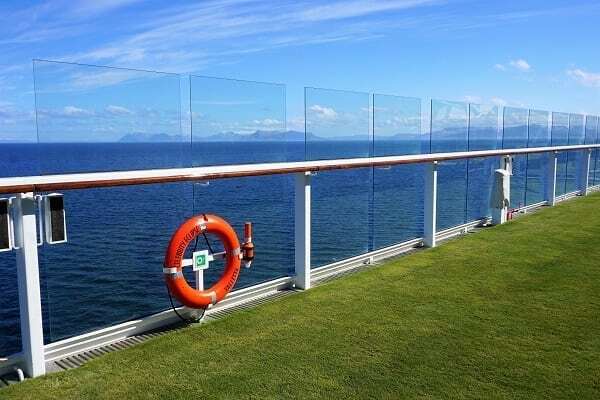 For our first cruise overseas, Celebrity Eclipse delivered a great vacation experience. 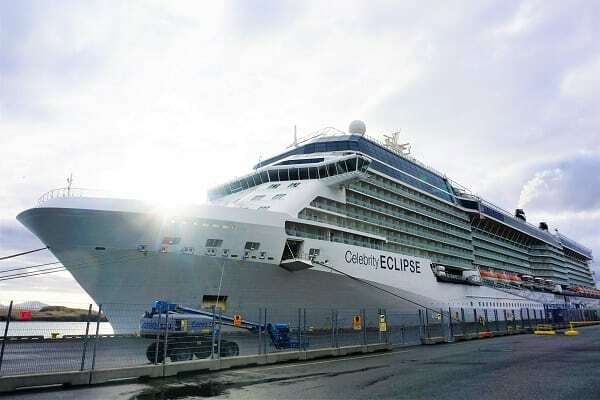 For mega-cruise ship fans, the ship was just the right size. 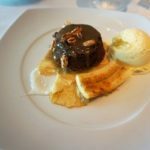 The food was delicious in all venues including the main dining room, specialty restaurants, and Cafe al Bacio, the service was more than prompt and accommodating, and we were able to enjoy ourselves in between the long days touring every port in the various venues throughout the ship. As for the locations, we were fond of all of the stops, and the entire trip was a memorable experience that we will not forget anytime soon. 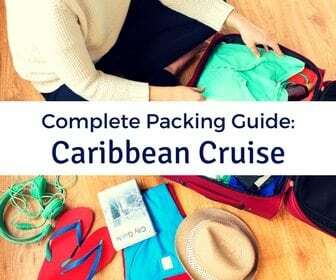 When it comes to cruising outside of the Caribbean, we have gone with Celebrity Cruises on both occasions, and we have never regretted our decision. 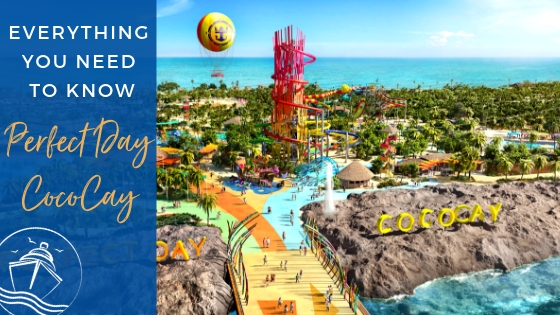 It will be interesting to see how the brand delivers when we cruise on Celebrity Edge in January 2019 in the Caribbean. 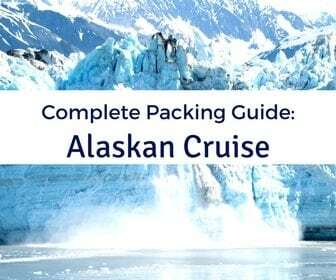 Also, we will be returning to Alaska this year cruising on the newest mega-ship in town, Norwegian Bliss. 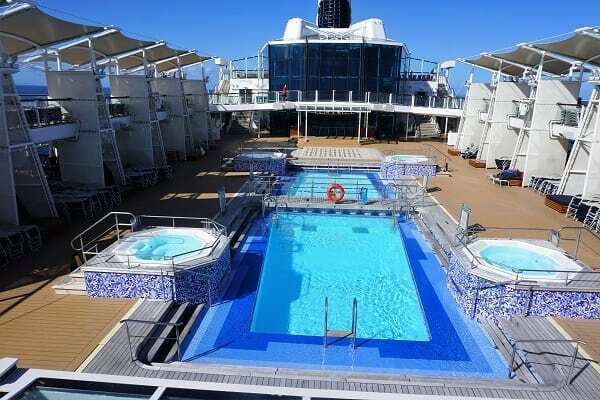 We will be eager to compare this cruise with our previous Celebrity Solstice trip. This Iceland and Ireland trip was undoubtedly special thanks to the cruise line and the ports of call. After touring Dublin and other parts of Ireland for six days straight, we dropped some family off at the airport and headed to the cruise terminal around 1:15 pm. Earlier in the day, an uncle and I delivered our luggage to the ship, as we had several large and heavy suitcases that we were not going to be carting around with us all day. During this pit stop, we learned that the processing and check-in point for the cruise were not located near the ship. Since we had no luggage to check when we arrived this time, we were through security, checked-in, and on the shuttle bus to the ship in about 15 minutes. 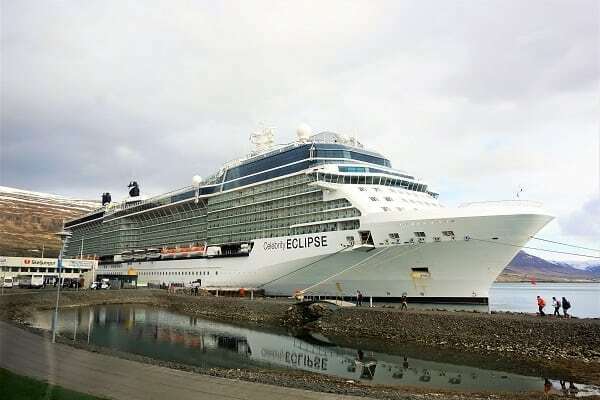 The short ride from the Dublin port to the ship was not exactly scenic, but once we arrived, we could see the Celebrity Eclipse in all her glory. The temporary gangway was open, and we could see other cruisers making the trek up to the fourth deck. Boarding the ship, we were each presented with a glass of champagne. I asked if the rooms were ready yet, and I’m pretty sure that the staff said not yet. 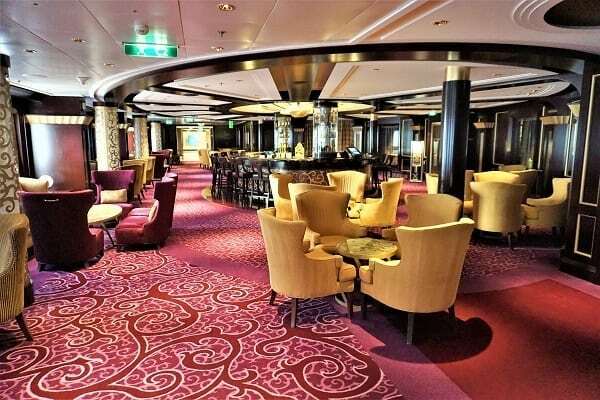 So, we began our routine of taking pictures of the ship’s public spaces starting with the open decks. After about 30 minutes, we bumped into our family who had boarded the ship a bit earlier than us. They said that they had access to their cabin and had already dropped off their carry-ons. It’s the first day of the cruise, and I am already getting things wrong; this was going to be a long trip. We continued taking pictures for about another hour, until we made our way down to Deck 8 and our room, 8245. 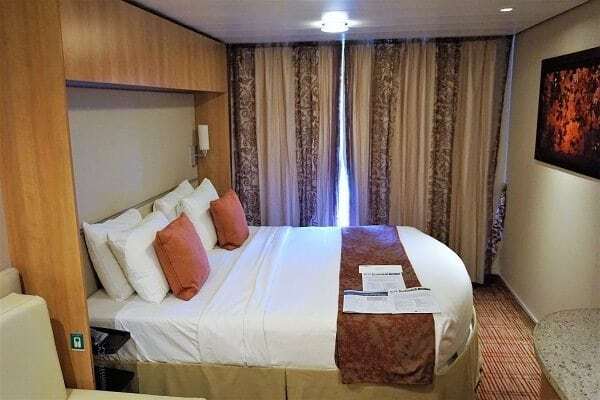 This balcony room was probably one of the larger cabins we have stayed in on a cruise, rivaled only by the junior suite we splurged on when cruising on Oasis of the Seas. Strolling up to our room, we noticed 3 of 4 bags were already outside, so we decided to unpack. There was only one issue; we did not have our last bag filled with all our toiletries. This piece of luggage was going to be essential if we were going to shower and change for dinner. While unpacking, our room attendant stopped by to introduce himself, and we indicated we were missing a bag. He assured us that the suitcase would be delivered soon. With all of the luggage now stored away, we decided to head down to muster a few minutes before the required time of 5 pm. Muster took a bit longer than usual, but we returned to good news. Our stateroom attendant said our missing suitcase was in our room. Thank goodness, the Princess would have her hair straightener and make up in time for dinner! Only problem, the bag he found for us was not our bag. Uh-oh. I guess we were not going to be able to freshen up before dinner after all. 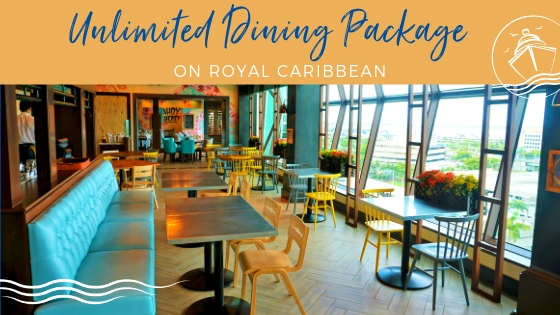 Even though we had called on several occasions prior to our cruise to link our dining reservation with our family, of course, we were not assigned the same table. So, we had to wait in a separate line to have the restaurant manager take care of the situation. 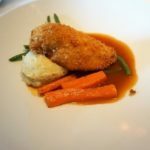 We were escorted to a table of four for the first night in the Celebrity Select dining room, but the problem would eventually be resolved for the remaining nights. 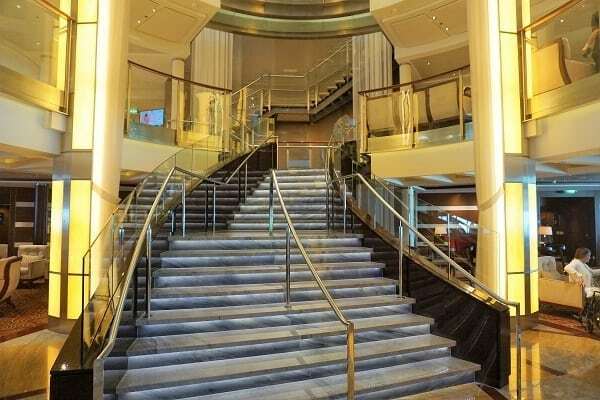 For the first night of a cruise, the service was more organized and smoother than the usual. 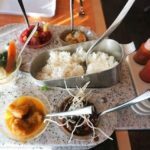 In addition, we were both impressed with the food that evening, as were our other family members who were new to the cruise line. There were a variety of items ordered, including the Night 1 staple of prime rib. 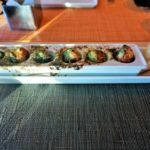 I tried some new options, including the Crispy Thai Spring Roll and the Seared Salmon. Both were excellent. The Princess did the Belgium Endive Arugula Salad and the Spinach and Ricotta Ravioli. 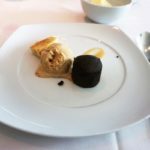 Dessert was rather average, but with the starters and entrees being better than expected, we were ready to be convinced of Celebrity Cruises’ supposed food superiority. Since we had to wait in line and deal with the first-night crowd prior to dinner, the total time spent in the main dining room was close to two hours. Leaving the restaurant around 8 pm, we made a pit stop to our room to see if our bag had been delivered. Nothing yet. So, time to drown our sorrows with some cocktails. The Martini Bar was packed, so we opted for something more low key at the Ensemble Lounge- an acoustic session with Michael Redden. He had a “pub performer” vibe with decent guitar skills. Texting our family, we told them that we would meet in Cellar Masters around 9:45 pm for the Silent Disco. We both thought it was odd that the silent disco was the first night of the cruise; however, we later learn that during this 10-night cruise they hosted the silent disco about three times. Arriving at the start of the silent disco party, it was a ghost town. The activities staff were beginning to hand out the headphones, but neither of us was really in the mood to dance. We waved down our family a few minutes later, and we all agreed to head over to the main theater a little early for the 10:30 pm show. Getting “our seats” port side in orchestra section, we also grabbed a second round of drinks. The name of the first show was Rock City. Not expecting much given the shows we saw on Celebrity Solstice, we were both surprised with the performance. It had a rock concert vibe with a solid cast of singers and dancers. Having had a full day, we were ready for bed when the show wrapped up around 11:30 pm. 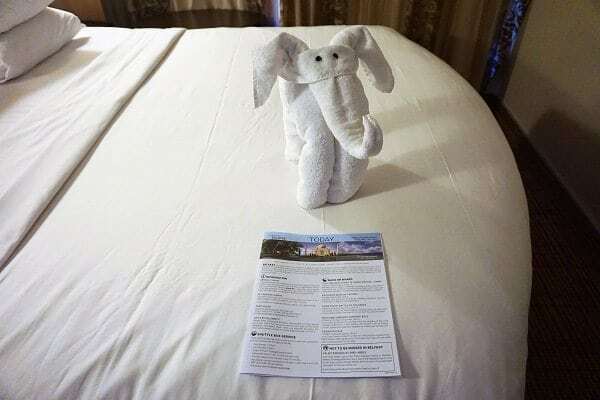 Back to our room, we were pleased to find a towel animal but disappointed that our missing suitcase was still not accounted for by the cruise line. I was forced to head down to Guest Relations to assess the situation. As I was walking to get in line, I could see our blue and green floral print suitcase behind the desk. After all, how could you miss such a cruise appropriate bag? Come to find out, the porters had broken the handle on the bag, so the luggage tags had fallen off with no means of identifying to whom the suitcase belonged. With the luggage finally in tow, I was back up to Deck 8 to ease the Princess’ concerns. 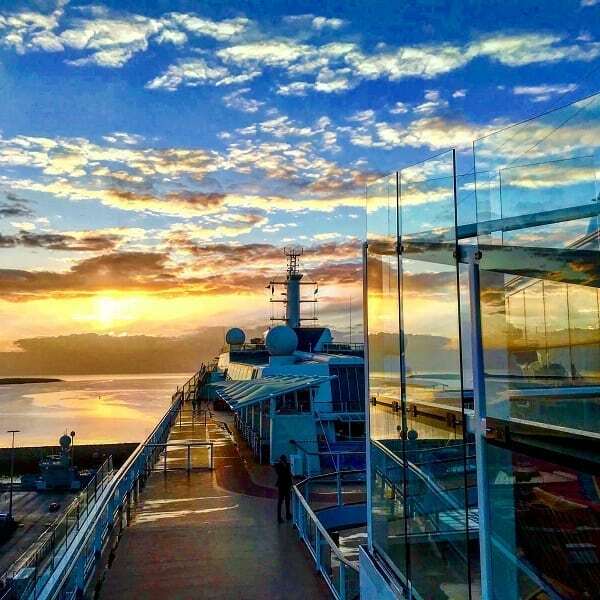 It was now bedtime as we had an early port of call tomorrow in Belfast, Northern Ireland, and we wanted to do and see as much as possible on our private tour. By now, we had been traveling and sightseeing for seven days straight, so the 5:15 am alarm was nothing new. As we wrestled ourselves out of bed, we watched the sail into Belfast Harbor. This would be only the start of the magnificent landscapes and pictures we would capture while visiting the country. 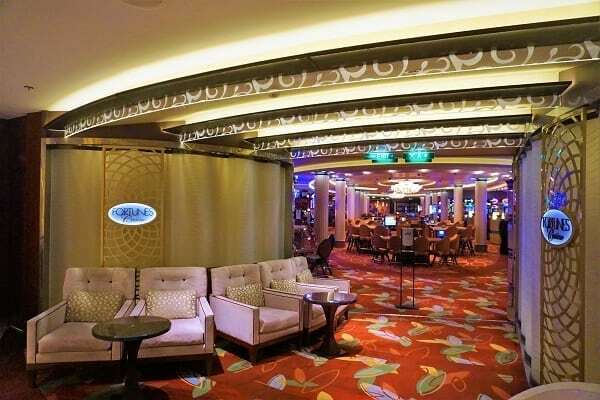 Most venues on the ship opened up between 6:30 am and 7:00 am. 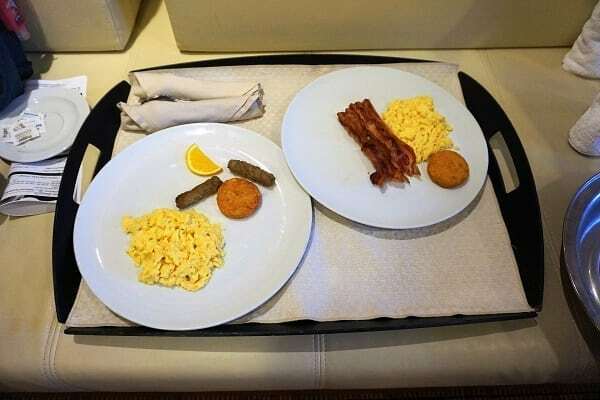 To ensure we were off and running as soon as possible, we opted for room service for breakfast. 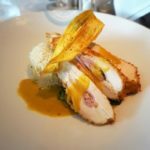 The selections were pretty standard, and Celebrity Cruises does still include select hot breakfast items like eggs, breakfast meats, and toast as complimentary. Scarfing down our breakfast, I ran down to Café al Bacio right when it opened to get us some iced lattes, as we were going to need caffeine to make it through the full day private Game of Thrones tour that we had scheduled with Black Taxi Tours Belfast. We were ready by 7 am and ahead of schedule for once. So was the ship, as it was cleared at 7:15 am. So, we left our room and continued to the lower decks and literally right off the gangway. While it was an overcast morning, we could see our tour guide Cyd standing there with a sign waiting to greet us. When I introduced myself and said we were ready to go, one of the fellow tour guides said, “Wow, you have the first people off the ship.”. While we were not the very first people, we were certainly among the first passengers. This would come in handy throughout the day as we always seemed to be one step ahead of the other tours and buses that were also visiting the same landmarks. 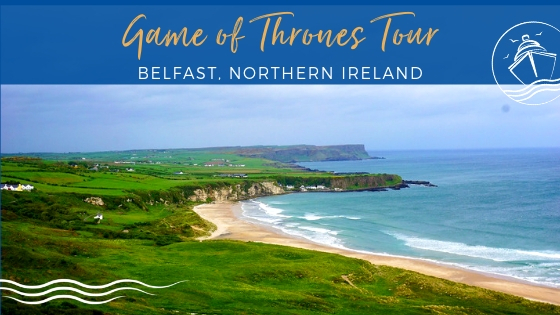 We had booked the Game of Thrones tour, which took us to several locations in the north that are featured in the show including Dunlace Castle, Ballintoy Harbor, the Dark Hedges, and the Cushenden Caves. 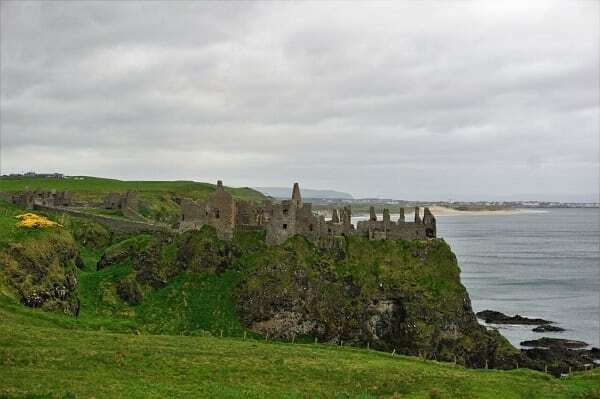 Along the way, we also stopped at some other notable attractions along the Causeway Coastal Route, such as the Giant’s Causeway, the Carrick-a-Rede rope bridge, and the Bushmills Distillery. While the weather was cloudy and windy with intermittent rain, we got to see almost the entire Causeway and snap plenty of photos along the way. 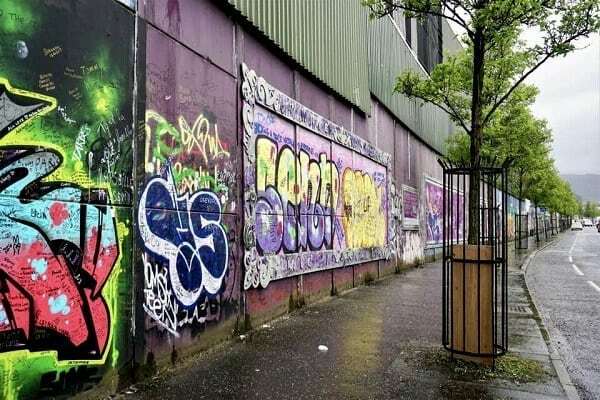 We even got to see a little bit of the city of Belfast and parts of the Peace Wall and the murals depicting prominent political and military figures that were part of the country’s “Struggles”. Yes, we did it all and more during the trip. Wrapping up the tour, we were back onboard by 3:45 pm. The only downside was that we did not get to do any shopping or pick up any souvenirs. Oh well, we had plenty of memorable pictures. 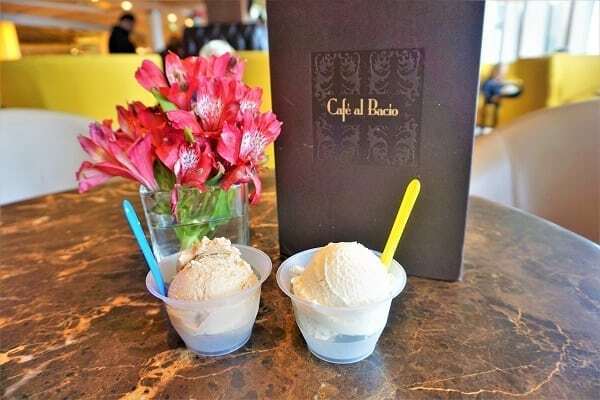 The cool and damp weather meant we needed something warm and caffeinated from Café al Bacio. 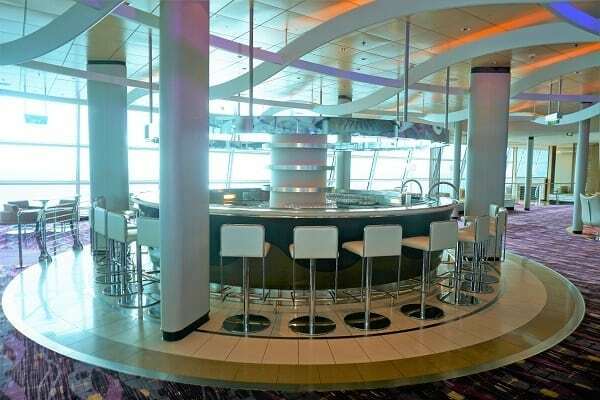 This is one of our favorite venues on Celebrity Cruises as the drinks are all part of the Beverage Package. 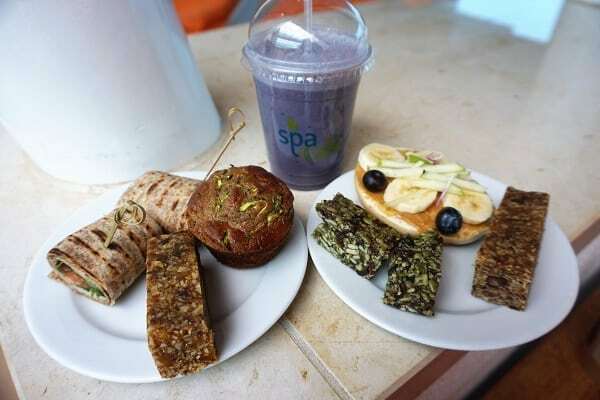 Not to mention, the complimentary desserts are always fresh, and the service is fast and friendly. 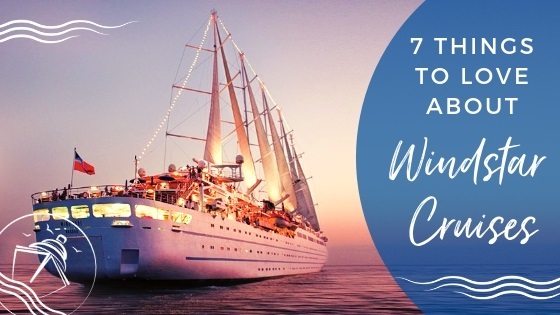 We could really get used to this modern luxury approach to cruising. Back up to the room, we warmed up a bit while watching some of the sail-out from our balcony. Granted, the surrounding dock area is not the most picturesque. While we were out for the day, we received notification of our new table assignment. Our new service team, including our waiter Vincent and assistant waiter Rojas, quickly came over to introduce themselves and tell us about the menu. Tonight, I had one of the best starters, the Braised Beef Ragout. 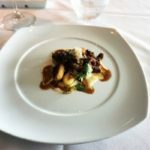 This dish could have easily been a meal with the tender short ribs and the gnocchi. For entrees, both the Princess and I went with Timeless Entrees. I went with the steak, and chicken for her. For dessert, she went with the Apple Pie, and I ordered the Chocolate Lava Cake. Dessert was good tonight but still the weakest part of the meal. With dinner ending a bit before 8 pm, this gave us time to find some seats for tonight’s game show, Battle of the Sexes. The activity took place in the Entertainment Court, which is a small open space right in front of the Main Theater. While not the ideal location, I guess it catches people’s attention, so the activities staff can get cruisers involved. Speaking of getting involved, I somehow got roped into being on the “men’s” team for a few of the events. Let’s just say with me on the team, we at least won one event! The show wrapped up around 8:30 PM, and we headed to the theater for tonight’s show. After seeing the musical production on Night 1, tonight was our first headliner, Pete Mathews. He was billed as a “comedy juggler”. I found his silly, over the top humor to be spot on, but the juggling was just okay. The show ended before 10 pm, and our team headed up to the Sky Lounge for the Totally 80’s Game Show and Dance Party. Again, I somehow got pulled into participating in the game, even though two ardent music fans were battling for the first and second place. Of course, we also had to get our drink for the “drink around the ship” from the lounge’s specialty cocktail menu. 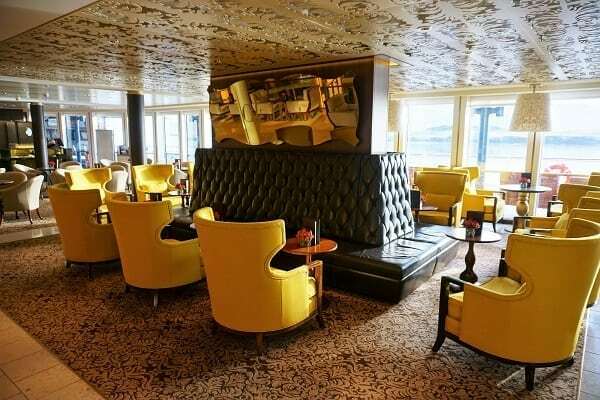 Another nice feature of the Celebrity Eclipse is that most of the bars have specialty cocktails that are unique to that venue. After about an hour, we were all starting to feel the effects from going strong since the previous Friday, so we decided to call it a night around 11:15 pm. 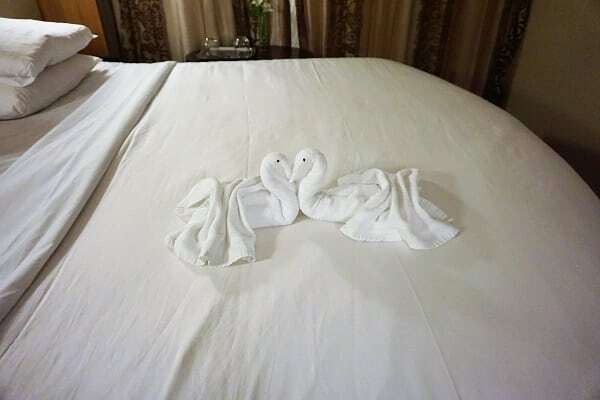 We returned to the room to find another towel animal, as we did every single night. Before saying good night, we warned our family that we were sleeping in tomorrow on our first sea day. Both of us needed the rest. The seas were quite choppy the night before, but that did not affect our ability to fall asleep. We slept over 10 hours with the time change, finally wrestling ourselves out of bed around 9 am. While the Princess got ready, I grabbed some lattes and breakfast pastries at Café al Bacio, which always had a wide selection of different treats throughout the day. As the weather outside was grey with some noticeable swells, we took our time getting ready. By 11 am, we strolled around the interior of the ship for about 90 minutes grabbing photos of the menus and some of the venues. During our travels, the Princess may have spent some time at her favorite slot machine which just happened to be prominently located near the casino bar. We decided to eat at the main dining room for lunch. I particularly enjoyed by Teriyaki Duck and Maple Pecan Pie. 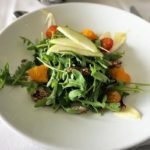 Again, we were slowly starting to agree with other reports that the food was better on Celebrity Cruises compared to some other lines. Finishing up lunch, we got a second round of coffee at Café al Bacio then headed to the main theater for the 2 pm Beyond the Podium talk on the Natural History of Iceland. The presenter was marine biologist Ken Williams. 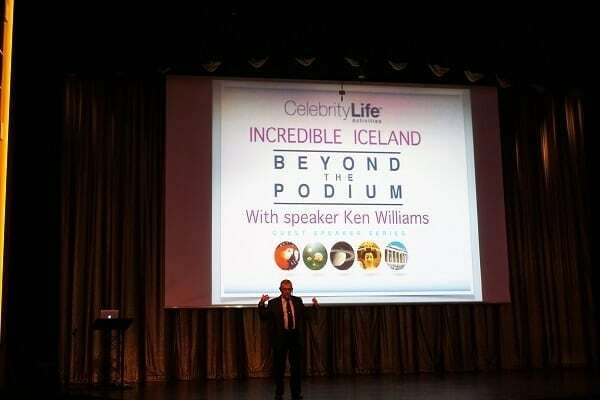 He had a wealth of knowledge on Iceland, but his presentation was a bit dry. I guess nothing can compare to Brent Nixon on Celebrity Solstice. Out of the lecture around 3 pm, we grabbed some bottles of water and went back to the room to do some blogging and check our emails.Tonight was Evening Chic, which meant the Princess was going to need some extra time to get ready. So, with the weather being rather dull, we wasted the rest of the afternoon on our devices and getting ready in our “chic” attire. It wouldn’t be a cruise if we didn’t take pictures. The photo studios opened up around 5:30 pm, and we were there right around that time to get as many stations as possible. Searching along decks 3, 4, and 5, we took photos at 5 of the 9 stations and were to dinner for 6:15 pm. On the first formal night, my go to meal is usually the roasted duck. Although, I had duck earlier in the day, so instead I tried the rack of lamb. Boring as usual, the Princess went with the grilled chicken from the standard menu. Dinner was rather quick tonight as our servers, along with the bar staff and sommelier, were starting to get accustomed to us. Out by 7:45 pm, we were able to walk around and mingle with a few of the officers as part of the Officer’s Soiree. 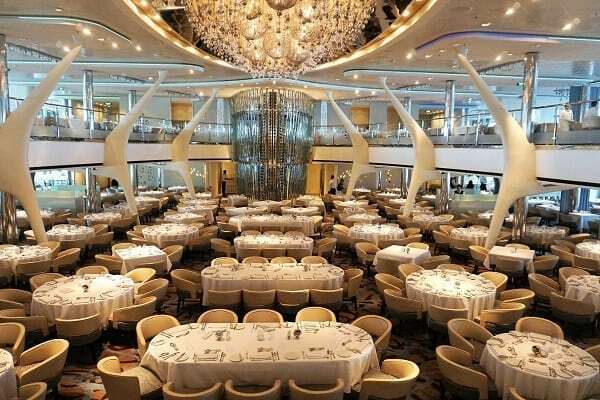 Although, on other cruises, this “Captain’s event” usually includes some champagne and a speech by the captain. Neither of these occurred during this particular event. Seeing some openings at the Martini Bar, we secured seats for the four of us and some pre-show specialty drinks. We would come back to this bar multiple times over the cruise as it was the liveliest and offered the best selection of specialty cocktails. Tonight’s show was a second headliner act, Nick Page, a West End singer and actor. He had a powerful voice and performed a variety of songs from different genres which would appeal to cruisers of all ages. Following his performance, we grabbed some drinks and prepared for the second show, the Liar’s Club. This featured the cruise director Eddy, Pete Mathews, and the activities manager Giuseppe. 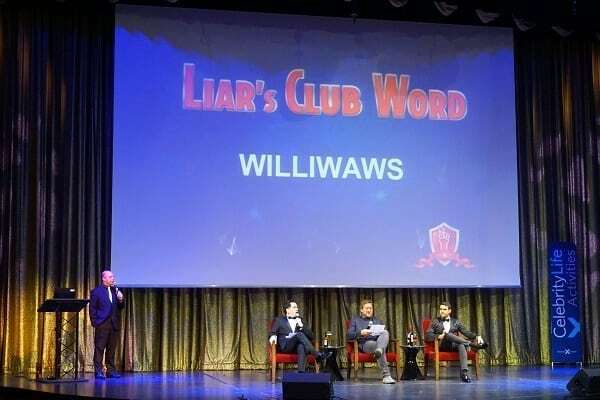 For those unfamiliar with the show, the host presents an odd word and all three members of the panel must give the definition, with of course only one of them telling the truth. The show was amusing, with the show stopper being Giuseppe and his hilarious answers that were magnified by his strong Italian accent and mannerisms. Exiting the theater at 11 pm, our family decided to try their luck at the casino, but the Princess wanted to return to Martini Bar for one more round. While we sipped our final drinks of the night, the live music of the Bryan James Band could be heard one deck below us in the Grand Foyer. Spending about an hour recapping the trip so far, as well as planning for our next day in Iceland, we retired to our cabin around midnight to find another fuzzy friend to add to our growing “farm”. 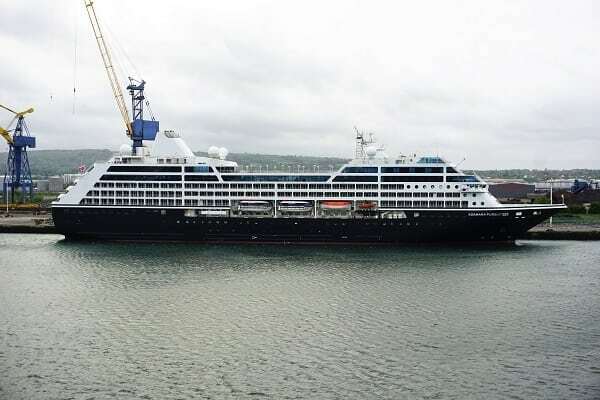 Today was a late day port with the ship scheduled to arrive in Reykjavik at 1 pm local time. 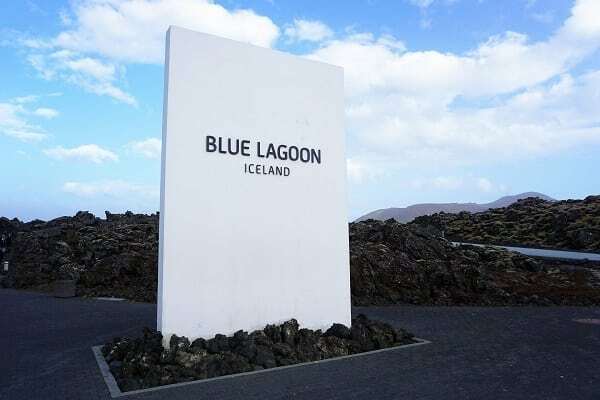 Prior to the cruise, we had booked a night time tour to the Blue Lagoon via Gray Line Tours. The Princess insisted we do the night time excursion for more spectacular vistas. Sounds good in theory, but there was only one problem- the sun does not set until 11 pm this time of year! The alarm was set for 8 am, so we did not waste the entire morning. I grabbed lattes, do you see a pattern emerging, while the Princess got ready and packed our day bags. The weather was noticeably nicer outside with some sun and mild temperatures, so we headed out to take some pictures of the surrounding areas. After venturing out on the decks, we headed to the buffet for breakfast. As you would expect, it was quite busy. 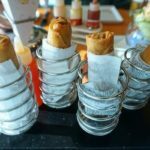 Breakfast is one of those meals that is hard to mess up, but Celebrity Cruises did a fine job with plenty of options, along with several custom omelet stations. As the ship inched its way closer to the dock, we went down to our room and continued to admire the sail-in from our balcony. Calling our family, we were down and in line to get off the ship a little after 12:30 pm with the gangway opening around 12:45 pm. Again, we were among the first off the ship. According to the information provided by the cruise line, the walk from the ship to downtown is about 45 minutes, and there is a shuttle for round trip transfers costing about 22 USD a person. I asked a cab driver how much it would cost for a ride downtown, and he said 30 USD. The quick math indicated that for a group of four the taxi was a better option. Hopping in a taxi, we were to the Harpa Concert Hall by just about 1 pm. We then spent the next three hours walking around the center of the city, traversing the shopping district. We did make it up to the Hallgrímskirkja, a Lutheran church that is a city landmark, to get pictures from the top of the bell tower. Unfortunately, there was only so much we could see and do before we needed to head back to the ship. With 4 pm approaching, we located a taxi stand for a ride back to the ship. This would give us time to get something to eat and switch our backpacks to include the swimwear and other items we would need for the Blue Lagoon. 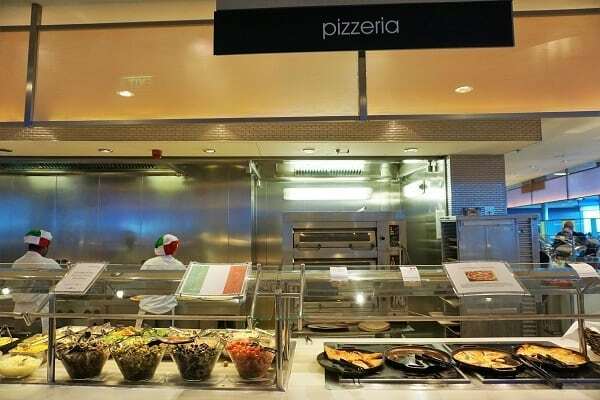 The one issue with dining on the ship was that there was nothing available at this weird afternoon time frame besides the Pasta and Pizza station in the buffet. So, we all snagged a quick bite and were down to our room to repack our bags and head out for 5:30 pm. The bus arrived within a few minutes and informed us that this bus would bring us to the bus depot where we would catch the shuttle to the Blue Lagoon. The 10-ish minute drive to the bus depot was uneventful. When we checked in at the counter, we learned that we were the only ones on the tour. So essentially, we were getting a private excursion to the Blue Lagoon. Our driver was prompt, so we left exactly at 6 pm and were to the Blue Lagoon in about 45 minutes. At the Blue Lagoon, lines were manageable, getting through the ticket queue and in the changing rooms within a few minutes. With our ticket, we received a locker and a towel, but beware, people steal your towels as they all look the same. Even though I purposely put my sandals next to our towels to indicate they were ours, they were gone when we came back for them. We got to spend 90 minutes in the water before we had to dry off and shower to meet our shuttle for 9 pm. Stay tuned for a full review of Blue Lagoon coming soon. All in all, we thought 90 minutes was the perfect amount of time to spend here. During the drive back, we all marveled at how bright and sunny it was outside even though it was approaching 10 pm. The sun was just beginning to set, so once we were back onboard, it was a race to the sun deck to get some pretty impressive sunset pictures. Even though we should have all been ready for bed, the extra daylight had us charged up for the night. So why not get a second dinner? 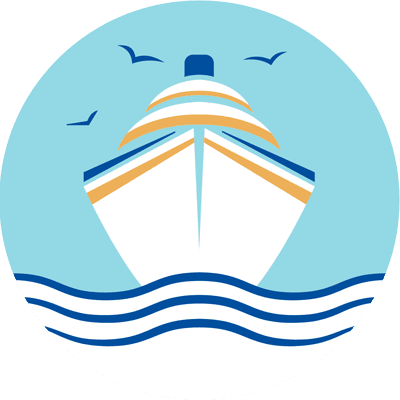 The cruise line purposely kept the buffet open late this evening as they expected many cruisers would be out and about in the city. The Oceanview Café was packed. It took some aggressive searching to find an empty table for four. 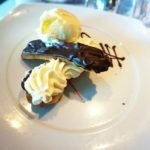 While neither of us are huge fans of cruise ship buffets, we both came to the conclusion that the food on Celebrity was a step above the other mainstream cruise lines. There was no more debating, we were officially sold. After each getting a full plate of food at nearly 11 pm, we did the only sensible thing, go to bed. The next day was an early tour that had us meeting at 7:15 am for an excursion to the Golden Circle. 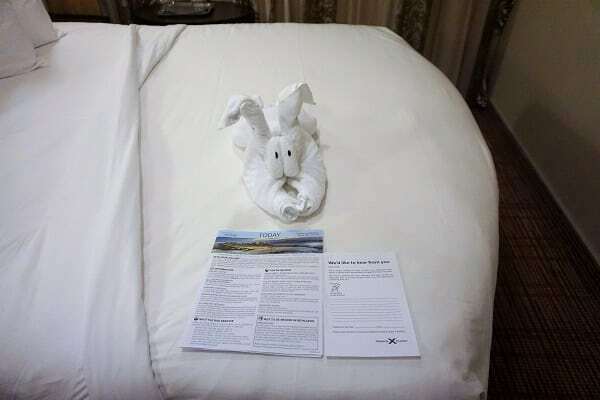 Good thing we had another friendly towel animal to welcome us back to our room. Our second day in Reykjavik had an early all aboard of 2:30 pm. Prior to our cruise, we secured a tour to see the natural wonders that comprise the Golden Circle with a local provider. This tour was only offered by the cruise line on Day 4, as it had a run time of close to 8 hours. We were able to book a package deal with Iceland Guided Tours that included this tour and another tour in Akureyri. However, in order to see everything, the tour was departing at 7:30 am. So, up at 5:15 am to get ready, we skipped getting breakfast and waited for Café al Bacio to open at 6:30 am for some coffee and one or two pastries. Our family was ready early, and we were off the ship by 7 am. Surprisingly, as we were all experiencing some cold-like symptoms by this point. Our tour bus was already more than half full by the time we got to the meeting point and checked-in. I guess we were not the only ones eager to get the tour started. 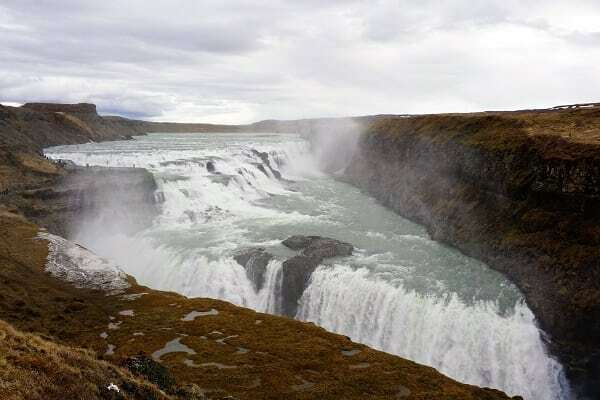 The tour stopped at some of the area’s famous natural wonders including the Gullfoss Waterfall, the Geysir area, and the Thingvellir National Park. Our tour guide was your prototypical Icelander and was very informative throughout the trip. He planned to get us back early for a mini-tour of the city, but we had to skip that additional portion due to a medical emergency with one of our tour member’s family back at the ship. 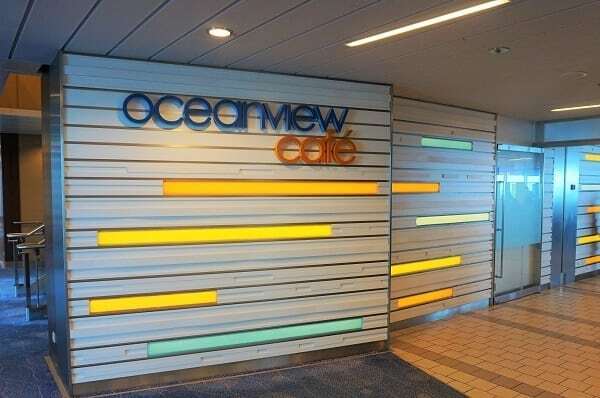 We were back to the ship for 2 pm and went straight to get something to eat at the Oceanview Café. With the all aboard time approaching, the venue was at capacity. We had to walk around for close to 10 minutes to find seats. 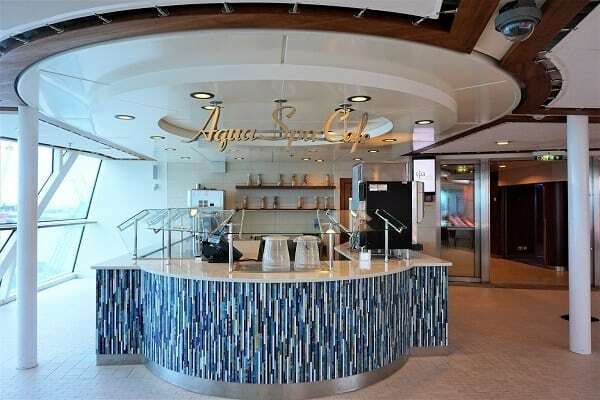 While we did find the food quality to be significantly better at the ship’s buffet, we still would have liked another option, besides the small Aqua Spa Café in the stuffy Solarium. Having one or two additional casual options with lighter fare would improve the congestion in the buffet that occurred at peak times. After lunch, we got some additional coffees to warm up and then returned to our room around 3:30 pm. These early and long days were starting to take a toll on us, so we were fine taking the afternoon off. We watched the sail away from our balcony and snapped a few more photos. The afternoon’s list of activities was limited anyway. We were at dinner for exactly 6 pm, but still did not beat our travel companions who were already at the table. Tonight had some fabulous starters, so I had to double dip with a Crab Cake and the Beef Capricio. 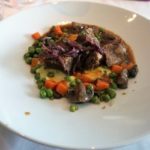 For entrees, the Princess ordered the Chicken Saltimbocca, and I went with another savory dish, the Braised Beef Short Ribs. 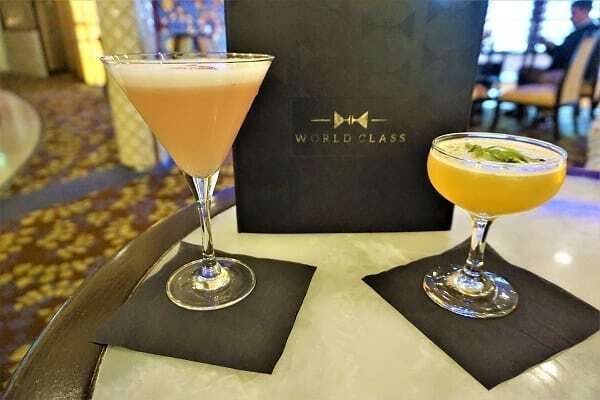 Following dinner, we continued our drink around the ship with our next stop being the World Class Bar. 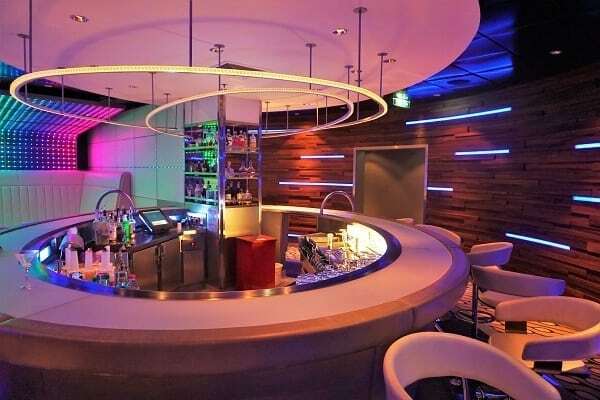 This venue offers a few specialty cocktails that are not fully covered in the Premium Drink Package. For the first round at this tucked away lounge, I went with the Johnny Walker Gold and the Princess had the Strawberry Fields. 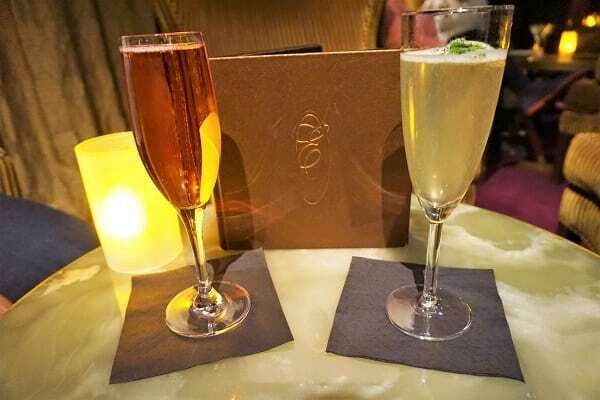 The drinks were smooth and refreshing, and we thought the menu was eclectic and original. The only downfall is that the small watering hole does not offer any live entertainment. After enjoying our cocktails for about an hour, we walked over to the Photo Gallery to look at the previous night’s pictures. There were fewer pictures than you would have expected to find with a ship of this size. We quickly found all of our Evening Chic photos and our Welcome Aboard shot. None of them met the Princess’ approval, so we moved on to the theater for the 9 pm show. Tonight’s entertainment was another production show Remade, which featured a variety of musical genres and dance styles from classical to modern. Again, it was far better than the shows we saw on Celebrity Solstice but lacked diversity. The show was over before 10 pm, and with the extended hours of daylight, there was another beautiful sunset. The only problem was that it was too windy and cold to enjoy the views from the outdoor Sunset Bar. 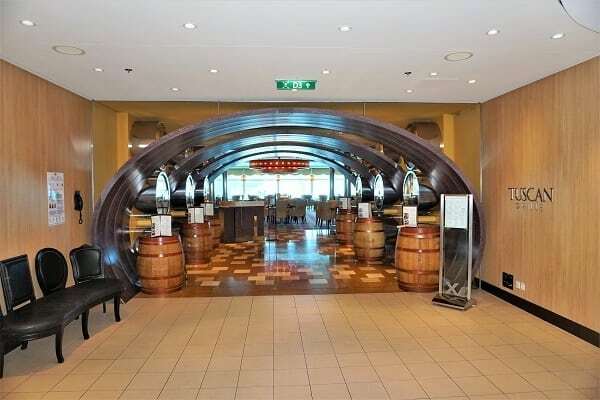 We decided to stay inside and trekked down to Deck 3 for our next drink around the ship stop at the Passport Bar. This bar had a rather standard menu. I went with the Rum Mule and the Princess gave the Pomegranate Mojito a whirl. We listened to the house band playing a variety of Beattle’s songs until after 11 pm. When the playlist changed, we finished our drinks and called it a night. We got to cruise through the Arctic Circle overnight, but we were not scheduled to dock at our next port, Akuyeri, until 10:30 am this morning. How many people can say that they crossed the Arctic Circle?! Still, we had plenty to get done today, so our alarm was set for 7:30 am. As the Princess got ready, I did my morning routine of getting us lattes and taking some pictures. The sun was out (for now), so I was able to get some outdoor photos. During my travels, I stopped in at the Captain’s Club breakfast to inquire about changing our dinner reservations. Originally, we were booked for Qsine at 6:30 pm. However, we were notified last night that there was a special Indian menu tonight. Neither one of us was feeling this departure, so I tried to switch our reservation to Tuscan Grille instead. The restaurant manager told me that the only reservations available were at 8 pm. There was no way the two of us were going to eat that late, so he put us on the wait-list for an earlier time and told us that we would receive notification by 1 pm if a table became available. By 9 am, we were both ready and decided to grab something quick for breakfast at the Oceanview Café. The crowds were on the lighter side, so we easily found a seat. As usual, breakfast was good, but the majestic scenery was even better. Even though we both like to eat, we like to take pictures even more! We watched sail in outside, pacing back and forth from both sides of the ship and capturing as many photos as possible. As we approached the dock, we returned to our room to grab our day bags. 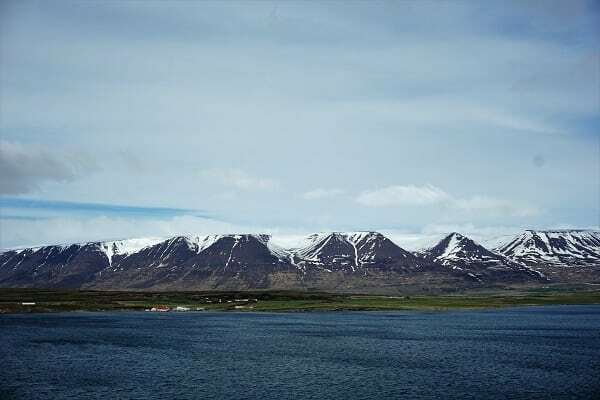 Today was the second part of the tour package that we purchased with Iceland Guided Tours. The directions told us to “meet at the pier” with the tour departing 30 minutes after the ship was cleared. Meeting up with our family, they mentioned that they added their name to our waitlist reservation for Tuscan Grille. We now had our fingers crossed that we could get a table as both our dinner plans were riding on it! It was just about 10:30 am when the ship was officially cleared. The scene at the port was a bit chaotic, with a variety of tour buses and operators holding signs. It seemed like everyone on the ship had some excursion booked. We saw our tour guide from the day before, and he pointed us to the correct attendant to check-in. Unfortunately, we were put on large bus with a different driver and tour guide. We finally departed at 11:15 am and did not return until 5:15 pm. We visited some of the natural wonders of this area, sometimes referred to as the “Jewels of the North”, including the Godafoss waterfall, the lava formations at Dimmuborgir, a high-temperature geo-thermal area, and a second natural spring bath. Admission to the baths was not part of the tour ticket though. On our way back from the excursion, we had prime seats to take photos of the ship docked in the harbor. Given that daylight seems to last forever in Iceland, the sun was shining as if it were the middle of the day. We grabbed more photos than we needed of the ship, and browsed the small gift shop right near the dock before getting back on the ship. After boarding the ship, we made a b-line to Café al Bacio as we all needed a nice hot cup of coffee. The pastries looked tempting too, but it was too close to dinner time. Speaking of dinner, we did have a message saying a reservation was made for us at Tuscan Grille at 7 pm. A bit later than we usually eat, but this turned out to be a good thing as we were able to relax a bit before dinner. We met our family a little after 7 pm and headed down to the restaurant. While I don’t like to be picky, I was a bit surprised that the restaurant was not very busy. During our entire time dining, the restaurant remained at most 60% full. So, there was no reason why they could not have changed our reservation in the morning and left us in limbo the whole day. Either way, it all worked out in the end. 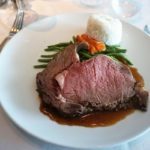 Dinner was one of the best dining experiences we have had on a ship, but it lasted quite a while. That might have been because we all ordered multiple appetizers, entrees, pastas, and desserts. The four of us split several apps, like the Antipasti board, calamari, meatballs, and kalamata bruschetta. Then, it was on to the main course. 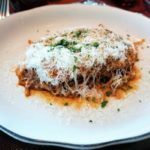 My steak was cooked just right, and the Short Rib Pappardelle Ragu was smooth and rich with a light sauce that glazed the pasta noodles. The Princess’ Chicken Parmesan was good as well. It wouldn’t be an Italian meal without some Tiramisu, Limoncello Cheesecake, and house-made Limoncello shots to top everything off. Eating and drinking for over two hours meant we were stuffed beyond belief and already 20 minutes late for the main theater headliner act. This was now the second show that we had missed on the cruise. With dinner wrapping up around 9:30 pm, we decided to get seats at Quasar for the 9:45 pm session of karaoke. It was also an excuse to cross this venue off our drink around the ship list. The karaoke session was not well attended, and I couldn’t convince the Princess to get up there and sing, so it was time to call it a night around 10:45 pm. But the Princess’ favorite slot machine was calling her name. We ended up spending about 90 minutes at the casino, using up our $5 match bets at the same time. By this time, it was midnight, and we really did retire for the evening. 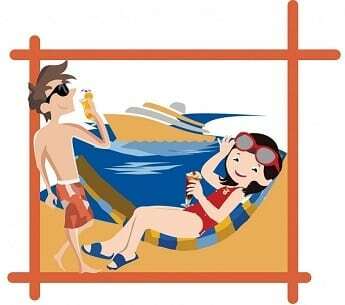 On most cruises, we use the bright and sunny sea days to relax and recharge. On a North Atlantic cruise, that is not really the case. This day, we were putting our clocks ahead an hour, so we finally wrestled ourselves out of bed by 9 am. 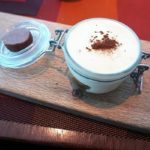 As the view outside was not looking very promising, we decided to skip breakfast and have a few pastries with our ritual lattes from Café al Bacio in the room. We decided it was time to venture out by 11:30 am. On the Princess’ list was trying out the lunch at the Spa Café in the Solarium. This was essentially the only other option for casual meals during the day. 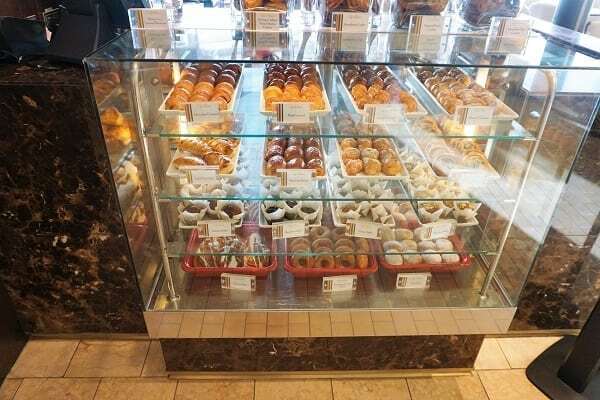 It is a small little takeout counter with a few selections. Upon arrival, the Solarium was crowded and all the chairs and the loungers were taken. Oh well, guess we would have to try it another time, so it was on to the buffet. Since the restaurant had just opened for lunch, we were able to find some seats right next to a window. Not that there was much to see outside, but it was nice to have a view. 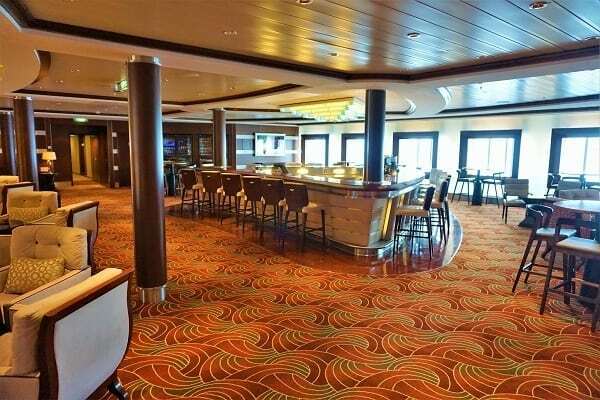 While it was cold, we snagged drinks at the Oceanview Bar for our drink around the ship. We stayed just long enough for a picture and headed back inside. I found lunch this day to be quite tasty, with some English inspired meals. 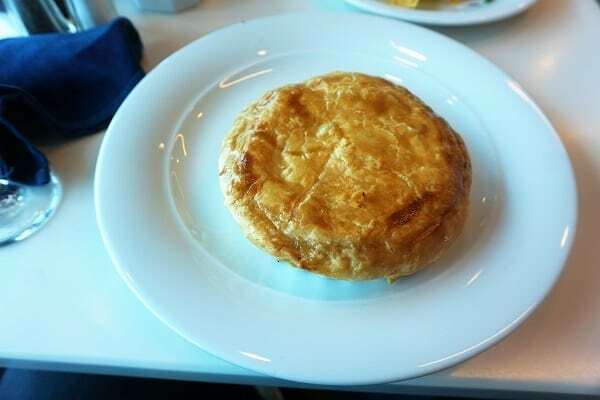 Yes, I had my fill while in Dublin, but the chicken pot pie and the meat pie where both hot and savory. Not that I should have had a piece of each one for lunch, but I knew I would work it off at the gym…when I got home. So, what next? How about a little dessert at the Gelateria. As Captain’s Club members, we each got one free scoop. While it was rather rare to find, we were able to score seats at the Café for about an hour. So, after getting some gelato, we got another round of coffee. 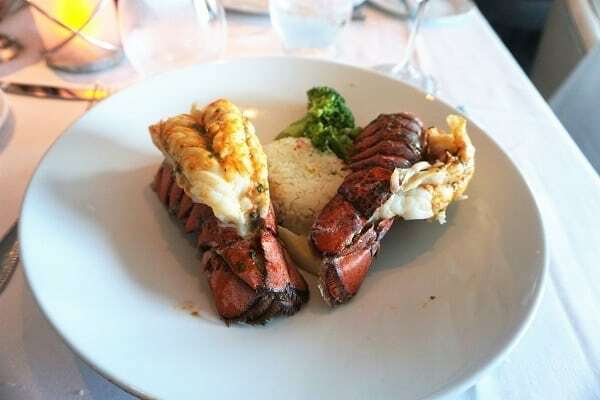 After all, when the weather doesn’t agree with you on a cruise, you can always eat! With nothing appealing to us on the list of ship activities, we just went back to our room. We worked on the blog and my real job for a couple of hours in the room up until dinner time. Looking to cross another venue off our drink around the ship, we headed to Cellar Masters for a pre-dinner drink around 5:45 pm. With only one bar server and a somewhat decent crowd, it took a while to get our glasses of wine. Strolling into dinner a few minutes past 6 pm, it was no surprise that our family was already sitting down. This time, our drinks were already ordered and on the table. Dinner tonight was a little hit or miss. The wife’s clam chowder was respectful, even for us New Englanders. 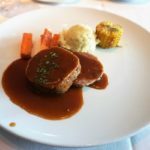 My Kobe Beef Meatloaf was just average, as was the Princess’ Chicken Kiev. Dessert too was a little uneven, with the wife’s odd eclair trumping my turnover. We were out of dinner by 7:45 pm. This meant we would not miss the evening’s entertainment. We got prime seats for the 8 pm Minute to Win It game show that was taking place in the Entertainment Court in front of the main theater. It was fun to watch the guests compete against the crew in some of the different challenges. The passengers prevailed, for the most part, due to the crew not really seeming to give it their all. With the game show ending at 8:30 pm, we secured our preferred seats in the main theater, grabbed a drink, and prepared for the evening’s production show, Topper. A whimsical tale with hints of Alice in Wonderland mixed with some steam punk, the show was entertaining, and the vocal leads did a fabulous job. Tonight’s party in the Sky Lounge was an ABBA dance party, which I knew would be packed. I figured we could get a more chill experience with the jazz scheduled at the Ensemble Lounge, but I guess we were too late as there was not a seat in the entire place. Okay, then it was up to the Sky Lounge, which was also a sea of people. We found some prime standing positions, which at least gave us a ledge to place our round of drinks. After about 45 minutes, the seats right in front of us opened up, so we pounced on them. 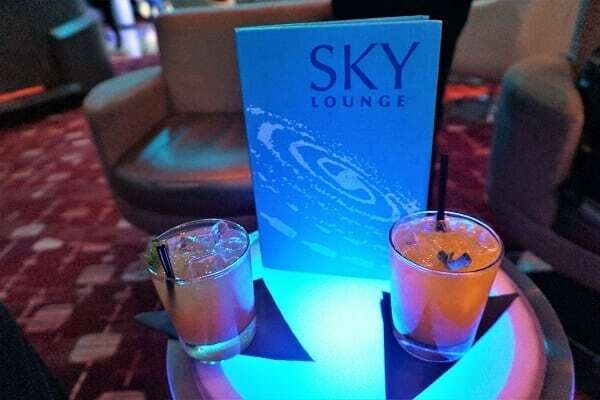 Of all the specialty cocktail menus, my favorite had to be the drinks at the Sky Lounge. So why not order a few more? We sat around singing and dancing in our seats to the 70’s songs that followed the ABBA dance party until slightly before midnight. As the crowd had now dwindled down to the serious disco goers, it was our cue to exit. Back at the room, we were greeted by our own tiny dancers. 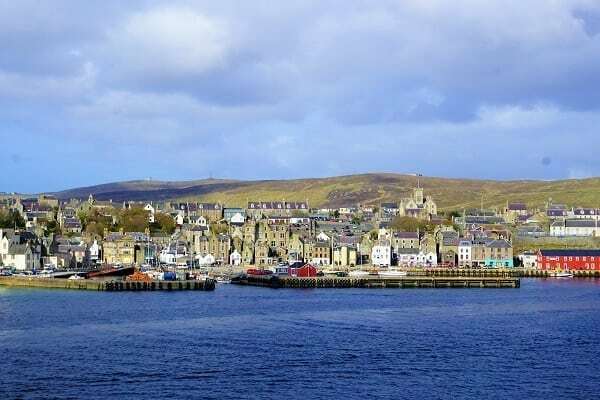 Our final port of call was Lerwick, Scotland. 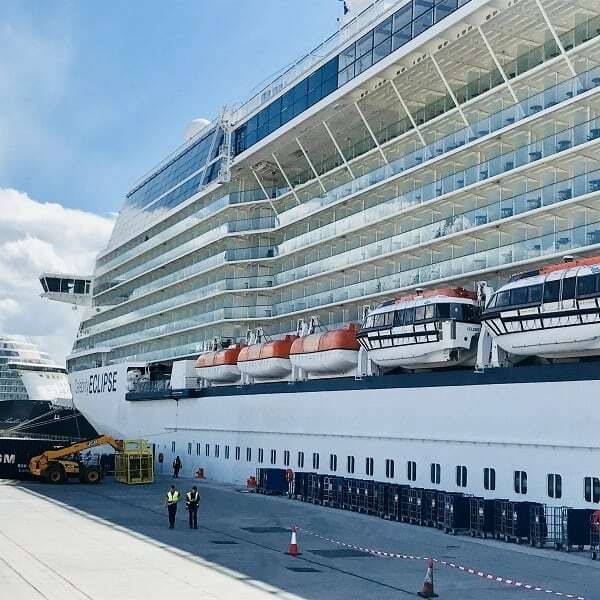 Given this port was also a tender port, and there did not seem to be much in the way of tours, we booked an excursion directly through Celebrity Cruises. The tour was slated to start at 11:30 am, but the tickets had us meeting at the theater for 10:40 am. That did seem a little early. The alarm went off at 7:30am, priming me to grab some coffees and much needed bottles of water to get our day started. Today, the Princess decided we should get breakfast at the main dining room. So be it, your highness! We waited in the short line for breakfast at the third floor of the main dining room around 9 am. Service at breakfast was very attentive, with the servers making multiple rounds with coffee, juice, and pastries. As for the main selections, they were good but nothing overly memorable. Breakfast was done by 10 am, and we made our way outside to watch the ship pulling into one of the most quaint and scenic ports that I have experienced. It looked like a movie set or something out of a medieval English village. Heading back to the room to grab our bag, we were off to our meeting spot in the main theater. The scene for the shore excursions was a bit disorganized as all of the tours were told to meet at the same time, even though the departure times were all different. Our tour was one of the last ones called, so we sat for a solid 30 minutes waiting to get on a tender. Even though it was windy, I braved the open air deck of the tender to get some photos of the ship out in the bay. The few minute tender ride got us to the small dock where we were quickly loaded on to the bus. Then, we were made to wait even longer for another tender to arrive with the last remaining members of our tour. By 11:50 am, the tour was finally underway. It included a few stops that I didn’t remember from the description with the highlight being the Eshaness Cliffs. Of all the tours we had taken throughout the trip, this one was by far our least favorite. The British tour guide was an older woman who was informative but very formal and dry. She routinely passed around flyers showcasing some of the different island highlights, wildlife, and history that she discussed during the tour. Back in the center of town by 4 pm, we walked around this picturesque town for about an hour, looking for some souvenirs and resisting the aroma of the fish and chips filling the air. Somehow I was forced into the fudge shop and ended up buying some local fudge and Puffin Poo. Hopping on a tender, we were back onboard and headed to the Sunset Bar. We enjoyed the views of the port and watched a Viking ship sail out for about an hour. Around 6 pm, we went back to the room to change for dinner. I stopped in at Qsine to see if we could show up a bit early for our 7 pm reservation. Since there was hardly anyone in the restaurant, the manager said we could come down whenever we wanted. Changing up, we ended up arriving by 6:40 pm. We then lived out the longest dining experience of our lives, taking almost three hours. 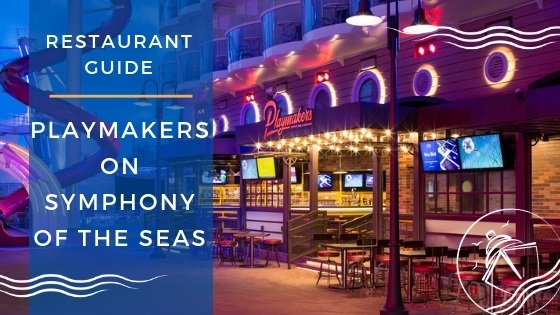 The restaurant concept offers a bunch of small plates, which are ordered and delivered in a few waves, but the service was just extremely slow. 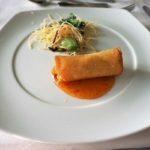 The food was delicious, with us sampling the Spring Rolls, Crunchy Munchies, the Chitini’s, and the Lobster Escargot to name a few. There were so many other great selections that we simply did not have time or room to sample. 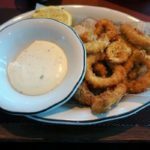 While we would return to Qsine for the food, the timing and pacing for this experience was very poor, which we attribute mostly to our waitress. I think she forgot about us at times as she had other larger tables that she was also serving and ended up finishing before us. Finally, we had our dessert and exited around 9:30 pm. This of course meant that we also missed this evening’s show in the main theater. Instead, we snuggled into some seats at the adjacent Ensemble bar. One round of drinks became several, and we ended up staying until around 11:30 pm. Somewhere in between the drinks and music, our family stopped by to pull up a chair and join us. As we discussed the cruise so far, the time passed quickly. When the performer called it quits for the night, we did the same. As the trip was coming to a close, today was our last official sea day. Unsure how we wanted to spend tomorrow, our last full day of the cruise in Dublin, the plan was to relax today. With no real plans or hopes for sun, we slept in until 8:00 am. My cruise morning consisted of the same ritual, coffees and more pictures. We took these beverages up to the Spa Café in the Solarium around 9:45 am. The Princess was determined to try this casual, healthier option. Sampling a few of the small bites, such as the different granola bars, I was pleasantly surprised. 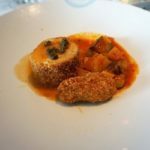 While we tend to indulge on cruises, the small bites here were a nice alternative, especially on longer cruises or when you spend several weeks a year at sea. Being lucky enough to snag some loungers in the Solarium this morning, we relaxed here for about two hours. We were not alone as several other cruisers were either reading, on tablets, or taking a nap. The normally humid Solarium was refreshing compared to the cold and windy outdoor weather. After a while, we were getting a bit antsy and were ready to move on to something else. Taking a look at the Celebrity Today, there was not much going on until later in the afternoon that interested us. So, we walked around the ship. 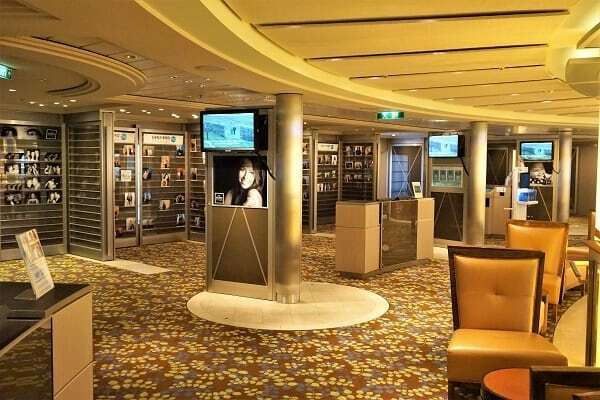 Some of the busiest places seemed to be the Library and Card Room at the center of the ship. We ran into our family during our travels and mentioned doing the main dining room for lunch. After all, we did do a “healthy” breakfast only a few hours ago. Lunch was satisfying again, even if the service was a bit slow. Following lunch, we decided to give the 60’s music and general trivia a shot up in the Sky Observation Lounge. On our way there, we stopped to get a second round of lattes for the afternoon. Finding some of the last seats in the house which were behind the bar, hearing the announcements was not the easiest. This didn’t matter as our team did not fare well in either trivia round anyway. As tonight was the second evening chic night, we finished up the trivia and went back to our room to change into our formal wear. We were down to the lower decks by 5:45 pm, giving us the chance to take pictures at three different photo stations. Honestly, it didn’t matter as we didn’t end up purchasing any of the photos. Given it was evening chic, that also meant it was lobster night! So, while I didn’t break my all time record, I was able to get our uncle in on the lobster tail mania with the both of us finishing off three lobster tails, a few starters, an additional entrée, and a dessert. A professional performance if I do say so myself. This seafood bonanza also meant we were in the dining room until 8 pm. 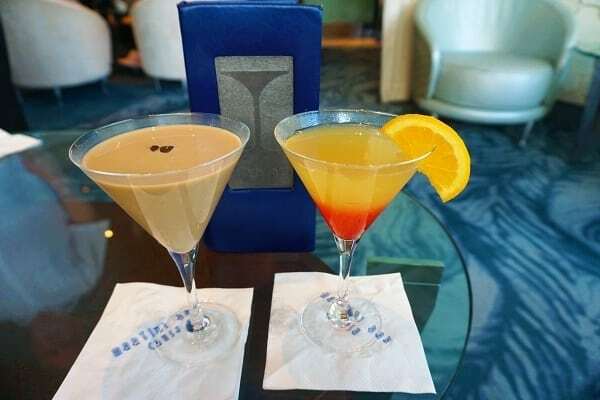 Feeling quite content, I still found room for a martini from the Princess’ favorite lounge on the ship following dinner. We sipped our drinks for a few minutes before heading to the show for 9 pm. Tonight’s performance was the last production show, Euphoria. This show heavily featured the acrobatic performers and was a visually stunning and engaging performance. Bravo to Celebrity Cruises for upping the quality of entertainment. We are really looking forward to the entertainment on our upcoming Celebrity Edge cruise. We stuck around after the show for the 10:15 pm Love and Marriage game show. The couple selection process was different than we are used to, but the questions were mostly similar with a few twists. The three couples provided a few laughs. Although, our uncle claims he ran into one of the couples who admitted that their answers may not have been 100% truthful. Finishing up after 11 pm, we returned to the casino to use some of our “free” game plays. We didn’t last too long, walking away empty handed again, and leaving our family to fend for themselves against “the house”. We decided to drown our sorrows in another cocktail from the Martini Bar. Hey, don’t judge as the Decadence Express Martini is delicious. 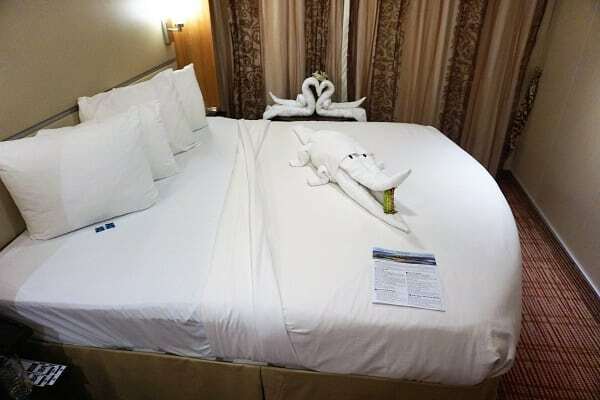 It was a little after midnight when we were ready to turn in and to find our last towel animal of the cruise (Unfortunately, we did not get one on the last night.). Deciding to pass on a shore excursion with our family in favor of enjoying our last day on the ship, we were able to sleep in until 8:30 am. The view from our balcony indicated it was going to be a beautiful day. We got ready and spent some time starting to pack. There was no way that I could carry four bags of luggage off the ship, so we were going to have to leave our bags outside this evening. We also booked the airport shuttle with Celebrity Cruises for the following morning. In hindsight, it was not necessary as there were plenty of cabs available, contrary to the cruise line’s claims. Yes, maybe there weren’t as many taxis as a Florida cruise port, but still enough. 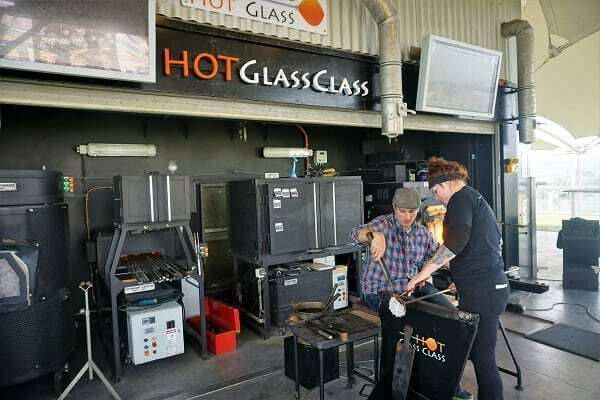 Finished packing and grabbing coffee, we went up to the Lawn Club to see if the Hot Glass Class had any availability right around 11 am. The instructor told us that there was supposed to be someone scheduled for 11 am, but the next slot was free. Somehow, the Princess convinced me to participate, even though she was the one who really wanted the glass work. With the 11 o’clock person a no-show, I handcrafted our glass flower ($50) for about 15 minutes with much assistance from the professional glassblower of course. During the class, the artist explains some of the steps in the process. Really, all you need to be able to do is pick the design and the colors. Prices vary depending on which item you choose to create. With our piece of work in the kiln to heat for 10 hours, we had the rest of this sunny afternoon to ourselves. As expected, the ship was rather quiet as most people were out exploring Dublin. Grabbing a table and some chairs around noon, I also got a hamburger and some fries at the finally open Mast Grill. After all, we had to try as many of the venues on the ship as we could. 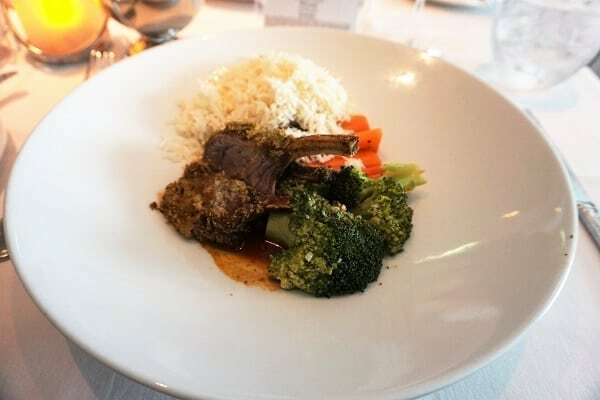 The food was good, a bit fresher and not as overcooked as the items in the buffet. 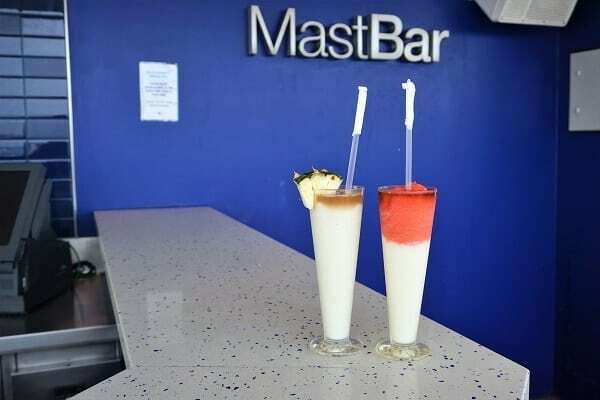 This weather also gave us the opportunity to get our first frozen drinks of the cruise. A very well constructed Pina Colada for me and a Miami Vice for the Princess. Enjoying the sun and our drinks made us feel like we were back on a Caribbean cruise. The Princess was now feeling some hunger pains (no chicken at the Mast Grill). So, into the Oceanview Cafe we went for some pizza and a few small bites. It always happens that the last day of our cruise ends up being an eating and drinking fest. Today was no different. When we were done with the “snack”, it was up to the Sunset Bar for another round of drinks and some more sun. Spending another hour or so outside, it was time to get some much needed caffeine. 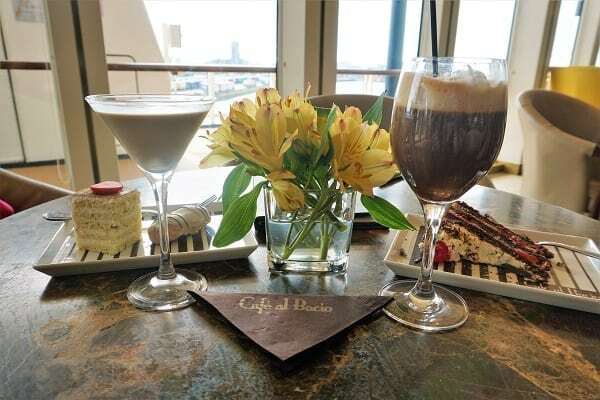 Inside the ship was just as quiet as the open decks, so we pulled up a chair at Café al Bacio with our coffee and maybe a dessert too. Back to the room around 4:30 pm, we finished packing and weighing three of our four suitcases. We would be leaving out one as we were going to have some remaining clothes and our toiletries. Ready for dinner early, we made one last stop at the photo gallery to see if there were any pictures worth purchasing. 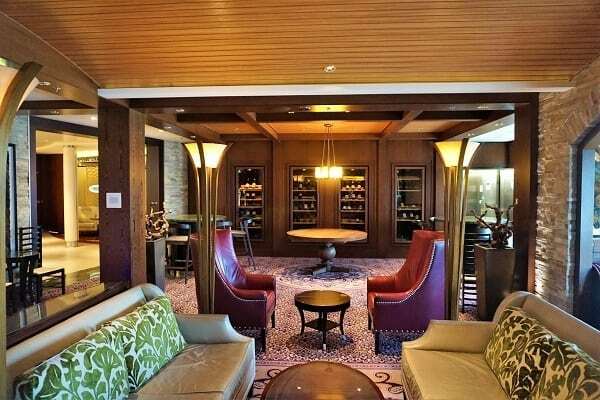 Sadly, Celebrity does not give tiered Captain’s Club members any free photos, so none were worth the price tag in our opinion. For once, we were to dinner right at 6 pm, but we still did not beat our family members. We heard about their day traveling to the Malahide Castle and the coastal town of Howth. Apparently, the city of Dublin was much busier that the previous days when we were there due to an Ed Sheeran concert and a soccer match. Good thing we stayed onboard the ship and avoided the crowds! Dinner was excellent as usual. 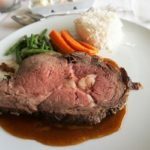 After the previous nights’ display, I went easy tonight with a shrimp cocktail and a prime rib, made just as requested. The Princess had a salad and the Chicken Chiquita. Dessert was particularly tasty this evening with the Sticky Toffee Pudding being a table favorite. Before leaving, we said goodbye to our entire service team and provided some extra gratuities to show them our appreciation for being so attentive during the whole trip. Finishing dinner close to 8 pm, we got less than an ideal view for the Reigning Rocks performance held in the Grand Foyer. 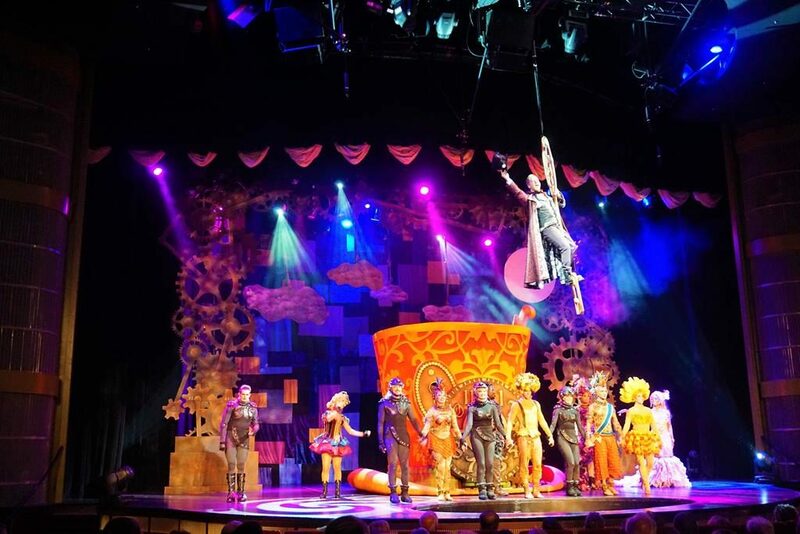 The show was a mix of rock and roll music featuring songs from the 60’s to present day, with a kind of British royalty theme, possibly due to the Royal Wedding that occurred earlier in the day. Following the show, we made a b-line to the theater for tonight’s headliner, Celtic Nights. One of the only regionally inspired shows of the cruise, this band and group of dancers were excellent. Perhaps the show is a bit on the touristy side, but we enjoyed the “authentic” local entertainment. The show occurs every night at the Arlington Hotel. If we are in Dublin again, I would consider attending the full two hour dinner and show. 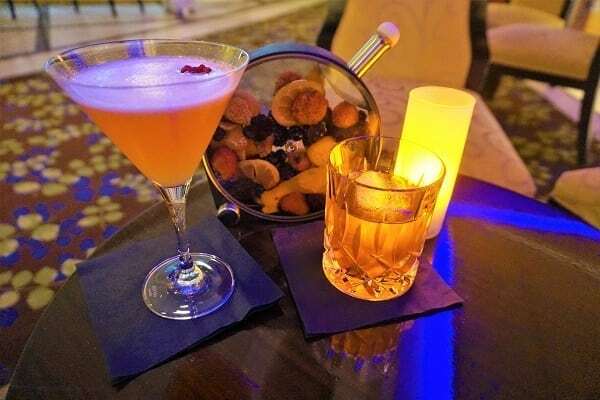 With no casino or additional night time entertainment besides the usual cast of musicians, we made the rounds to a few of our favorite lounges. This tour included getting some of the more experimental drinks at the World Class Bar. These cocktails were good but not sure that they were worth the up-charge. Finally, it was some parting drinks at the Martini Bar while we listened to the band in the foyer and did some people watching to see who was going out in Dublin for the evening. We can only imagine how packed the Temple Bar area must have been. By 11:30 pm, it was finally time to call it a night. 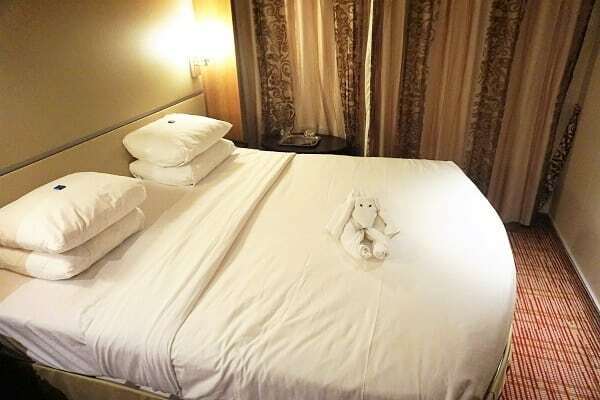 We returned to the room to find no towel animal and our bags gone. Oh well, the cruise was almost over. Soon, we would be heading back to the states and back to reality. The following morning was a prototypical disembarkation day. After getting ready and grabbing a coffee and a snack, we disembarked when our number was called with a very short queue. With no customs to clear, we found our bags in the makeshift storage area that was created right next to the ship. Following signs to the reserved shuttle bus, we were checked in and loaded to the bus with no hassle. By the time the bus was mostly full, it was a short ride to the airport. There, we had to wait a while to check-in as our flight was not until 3 pm. Once we were checked-in and through the several rounds of security, we all sat in the gate area on our devices. The flight and ride home were uneventful. Finally, we returned to our house after 17 days away exhausted and not looking forward to a full work week…or to the overgrown grass that desperately needed to be cut. 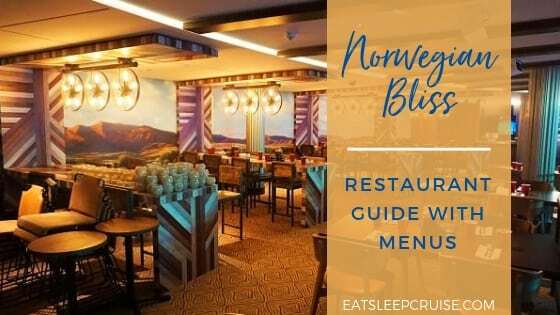 But, we had the reassurance of another cruise in just over a week on the new Norwegian Bliss! 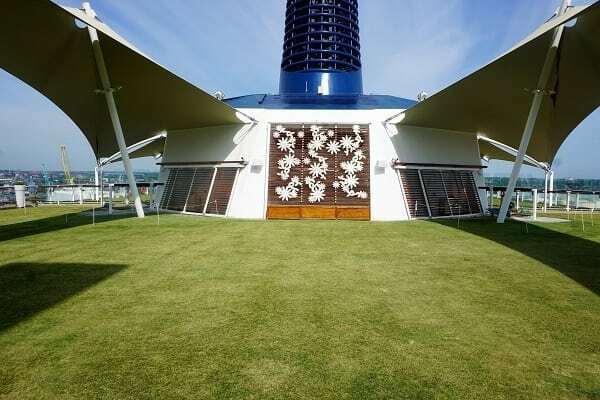 Have you sailed on Celebrity Eclipse? 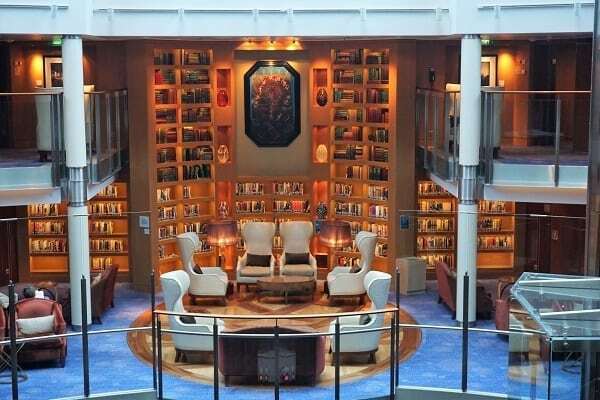 What do you love about Celebrity Cruises’ Solstice-class ships? 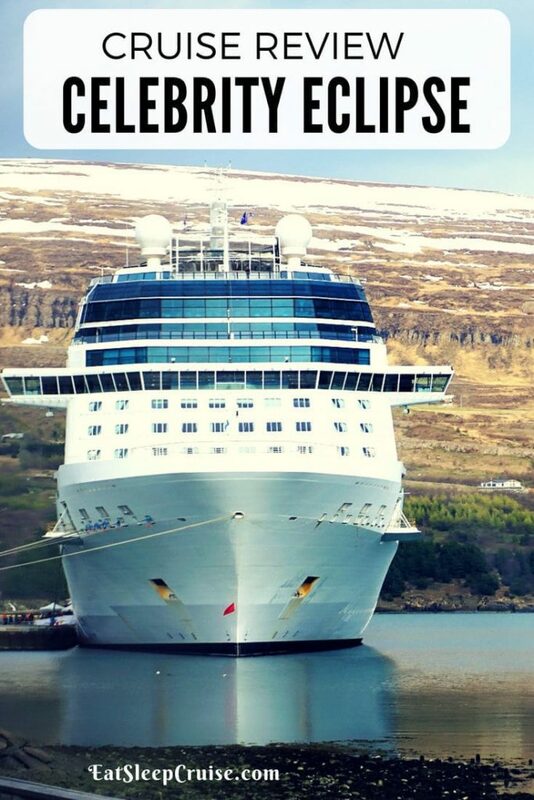 Drop us an anchor below to tell us about your experiences cruising on this amazing ship. was this a sponsored trip or did you pay?